These days, it feels like all the big players of the notebook world can be neatly split into two camps. There are those chasing the lifestyle crowd, lamp-shading their hero product with slick aesthetics and treating the notebooks as something that’s much a fashion choice as it is a technical one. Your Apples, Microsofts and, more-recently, HP fit right in here. Then, there are those who follow the road of least resistance. The path that crunches the numbers and asks the question “how do we take this further?” If you’ve spent decades following this path to success, why deviate from it? Sure, it’s predictable - but it works. Sometimes this trajectory is set forth by engineers, other times by marketers. However, it’s always going to be a little more conventional than the alternative. A little safer. The Acer Spin 5 fits this bill. There’s nothing particularly innovative here but the price-point and conservative form-factor are sure to find fans nonetheless. Not everyone needs a laptop they can show off. Some just need one that will get the job done - and this will do that - even if a few compromises have been made to land that lean price-point. 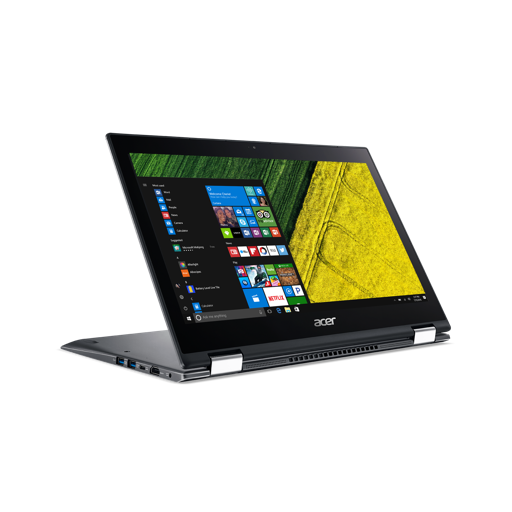 The Acer Spin 5 is a 2-in-1 convertible notebook that runs on Windows 10, Intel’s 8th gen processors and a 3-cell Li-Polymer battery. 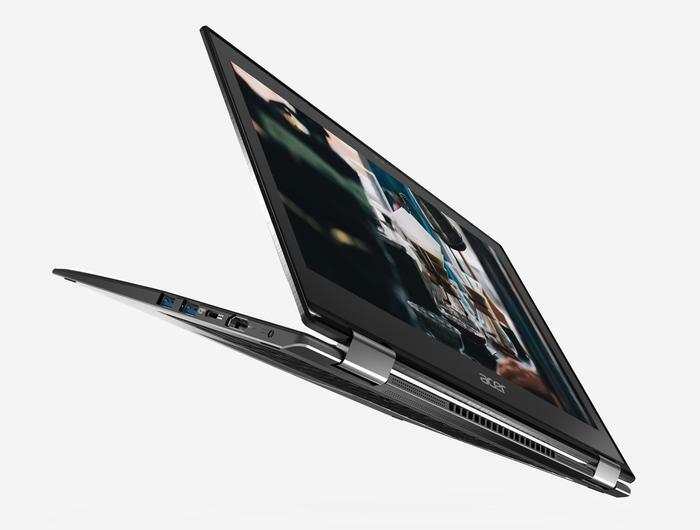 Available in 13.3-inch and 15-inch variants, the convertible features a 360-degree hinge that allows it to be used as a conventional laptop or tablet. It’s also got a built-in HD webcam, fingerprint sensor and microphone and, in terms of connectivity, it boasts Bluetooth and W-Fi- connectivity (802.11ac). Meanwhile, when it comes to ports, the Spin 5 is packing a 3.5mm audio jack, SD card, HDMI-output, USB 2.0, 2x USB 3.0 and USB-C.
Like any big-brand PC notebook, there are a ton of different configurations available. The model we reviewed ran on an Intel Core i7-8550U processor, 512GB SSD, 8GB of DDR4 RAM and boasted a 13.3-inch Multi-touch FHD IPS LCD display. However, should you opt for the 15-inch model, the Spin 5 can be kitted out with up to 16GB of RAM and an Nvidia GeForce GTX 1050 graphics card (in lieu of the usual Intel UHD 620 integrated graphics). As alluded above, the Acer Spin 5 hits a pretty conservative note in terms of its design and aesthetics. Even in its new, upgraded form, it’s all grey. The Spin 5 fits the Acer mold - for better or worse. The silver linings and shaved steel edges distinguishing it well from the Macbooks and Surface Laptops of the world but less-effectively against the more affordable, generic laptops it's competing against in price. The form-factor here is closer to a laptop than a tablet, with pretty large bezels spacing out the usable part of display from the physical edges and a matching gap between the keyboard and the portside of the Spin 5. Unfortunately, the heft and weight to the Spin 5 means that you probably won’t end up using it in tablet mode for extended periods of time. Again, it’s much more of a laptop than the alternative. The fingerprint sensor works well enough - though your mileage with the location (integrated within the trackpad) may vary (I wasn’t a bit fan). Likewise, I found the power button on the side of the device was a tad sensitive. Several times, I accidentally turned off or put the device in sleep mode without meaning to. These aren’t exactly deal-breakers, mind you. However, for a notebook that plays it this straight, it feels like there are a lot of easy pitfalls being stumbled into here. Under duress, the Spin 5 does generate quite a bit of heat. That said, I was pleasantly surprised at how relatively quiet the fans sounded (for the most part) and how well the device’s three-vent design worked to redirects that heat away from the user. Unless you stick your hand directly near one of the vents, it feels like you’d hardly notice how much heat the machine gives off. I was less impressed with the display. Even if this is placed into the more-affordable stretch of the convertible segment, the FHD IPS display just doesn’t look all that sharp. It’s perfectly usable and works well enough for web browsing but doesn’t offer a hugely great experience for more cinematic experiences - letting down the otherwise-solid Dolby Audio that Acer have stuck into the convertible.